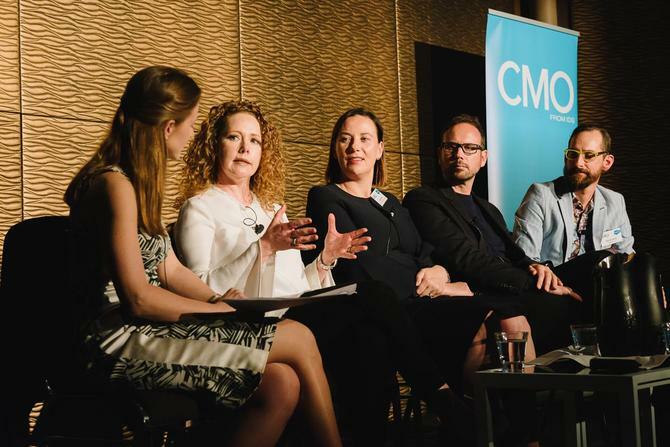 To honour CMO’s 5th birthday as a brand, marketing chiefs from Uber, Tourism Australia, Australian Sports Commission (ASC) and Salesforce participated in a panel discussion at our special event on 23 May to discuss what’s changed about the remit and strategic approach to marketing in recent years. They also shared how they’re coping with demands to be technologists, customer custodians, change makers and commercial and growth contributions in their organisations. “Five years ago, we were all aware of digital disruption – it started changing things and behaviour dramatically. But one of the things we did probably incorrectly is we went so heavily into measurement,” Tourism Australia CMO, Lisa Ronson, told attendees. “I’m not saying it isn’t important, but just because you can measure it, doesn’t mean it becomes effective. Data and technology has been a game-changer in this regard. A big plus for Tourism Australia has been the ability to define who the target audience is – the high-value traveller - then go and get them using behavioural targeting, Ronson said. Through insights and technology progress, Tourism Australia is also able to personalise the website experience for four out of five visitors coming off the back of its recent US campaign efforts. “We are looking at eCRM so we can continue the conversation once they’ve come to Australia and had a great time. Advocacy and word-of-mouth via social channels and humans is so critical to destination choosing,” Ronson said. Uber director of marketing A/NZ, Steve Brennen, saw his marketing approach driven by the same motivator it always has been: To be customer led. But he agreed the tools are very different today versus five years ago. Specifically, the marketer’s dream of being able to personalise at scale is being realised through data and tech innovation, raising interesting dichotomies between human and machine in marketing teams, he said. “When the going got tough five years ago, I would have said we need to work a bit harder to crack through it. Not it also involves leveraging better machinery,” Brennen said. “It’s challenging – you used to pull in more people to go and get better insights, test control campaigns to segments. This can be completely done by machines and often much more quickly and better than humans. Louise Eyres is the ASC’s first CMO and noted the concept of ‘customer’ is only half a year old at the commission. It’s a remit that also requires assuming direct responsibility for driving revenue. One way Eyres is looking to achieve this is by finding ways of utilising the group’s high-performance athlete data points to drive customer engagement and commercial impact. This is seeing the ASC seek new partnerships with like-minded organisations which could be health insurers, software providers, manufacturers and more. With a Government mandate to take on physical activity across the entire Australian population, the ASC is looking to extend out from its emphasis solely on high-performance athletes and participation to also include initiatives for 0-5 year-olds, over 65s, and more. Salesforce APAC product marketing lead, Derek Laney, cited the shift from tech provider to partner and advisor as a key evolution in the last five years. What has arisen, however, is a shortage of skills in market to use tech tools effectively. “That has been our change in focus at Salesforce in the last 12 months – to stop selling, start training and finding ways to scale and grow skills. That’s really what’s limiting our growth. The limiter is the skills to adopt the craft,” he said. As technology has grown up, organisations have needed to go through a parallel business transformation. For Laney, this is about creating an environment where people are encouraged to learn. “We are coming to customers and saying we want to partner with you to help grow the skills in the organisation because unless you’re Uber, you probably won’t get the data scientist off a Seek ad. You either need to sit on the technology or grow skills internally,” he said. All this is changing the relationship with customers, too. As an example, Laney highlighted the restructuring to be more customer-centric at financial services provider, Mercer, a Salesforce client locally. What was also clear from the panel was the need for CMOs to take calculated risks and work on fewer, more impactful marketing programs. The big example is Tourism Australia’s multi-million dollar Dundee Super Bowl 60-second ad, one element in a two-year strategy to win over the US market. “That initiative in and of itself change the way we operate internally, the way we operate with the government, with partners and how we operate with our industry. It’s been a great success,” Ronson said. To be brave and do fewer, bigger, better things, you need the foster right organisational culture while also trusting your gut, Ronson advised. Brennen also advocated supporting bravery and taking risks culturally, even when something doesn’t work out the way you planned. “I think we’re entering a new era where companies need to innovate more for their customer. The customer continually wants more and if your company isn’t offering more, they will become more dissatisfied,” he said. Eyres said her change agenda as CMO is making Australia the world’s most active nation, full stop. Whatever the bet you make as a CMO, it has to come back to customer, Brennen said. “I also think CMOs when they join a new business should interview the company to ensure the company does care about customers. Ask the CEO for the number one metric that matters and that you’re working to – it tells you a lot. Brennen’s approach right now is about trying to tap into and drive habits. “We know you have 21 meals a week and everyone will have dinner tonight, so how do you build that habit in and use data and insight to do that is key, as is how you build a great experience around that if you choose Uber Eats tonight,” he said. “If your first experience is average, then we’re going to have to work so much harder next time.